Dragon catches a taxi and prepares to head for home but leaps back into action when another gargoyle gains life and attacks the Turtles. The combined might of all five heroes destroys the creature as they had done with the previous entity. Intrigued by what is causing the stone beings to become mobile, the superpowered police officer reports in to the nearest NYPD station. Dragon learns that a number of elderly women are being abducted and all have been discovered hours later, drained of all life by unknown means. The involvement of a possible freak prompts the hero to remain in New York to get to the bottom of the mystery. A sorceress named Virago grows weaker with each new creation she breathes life into. She becomes desperate and conjures up a number of large lion gargoyles that are ’guarding’ a huge library. These beasts are sent to eliminate the four mutant ninjas that had helped destroy the two previous entities. 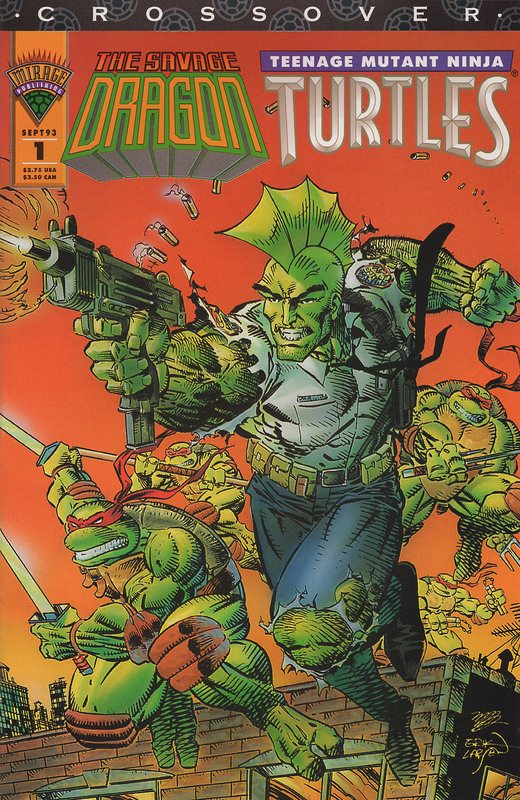 The Turtles launch into action to battle the rampaging beings and are joined by Dragon. In a relatively short period of time, the combined might of all present negates the threat of the lions and it is time for the desperate Virago to confront her foes directly. She states that she could awaken every single gargoyle in the city but her lies are transparent as she is visibly weak. The villain is arrested and sent to prison for multiple murders, allowing the Chicago-based freak to return to his own city, thanking his new allies for their invaluable help on the case.